**** Chosen by Winner: Michael A. You may have seen other “shooter oriented” tools, but what makes Multitasker unique is our weapon-specific design approach. Nothing else can rival our feature set for the AR platform of rifles or match our build quality. Unlike other mass produced multitools, Multitasker utilizes “best in class” materials and production methods to achieve build quality that is head and shoulders above the competition. For example, instead of cost-saving investment castings, Multitasker employs CNC machining (and solid billet steel material) to make the plier head and other major components. G10 scales, commonly used for tactical knives, are selected to help insure a slip-resistant gripping surface. Aluminum-bronze washers and rust resistant Ti CarboNitride (TiCN) treatment on the pliers help provide for maintenance-free operation. Of course we’re big fans of the Multitasker Series 3. But we understand there may be times, or places, that you need to bring minimal gear. The Multitasker Twist saves space and weight by giving you the essentials. 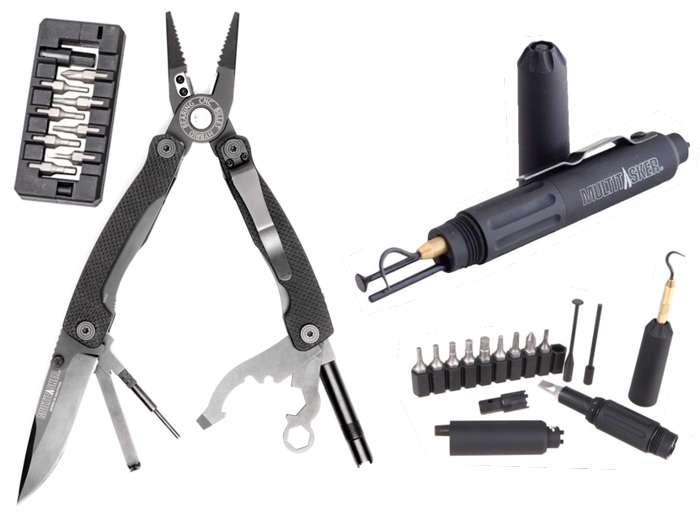 Packed into the size of a permanent marker you’ll find an Aimpoint Micro sight adjustment tool, dental pick, 3/32′ pin punch, carbon scraper, pocket clip slotted screwdriver, front sight tool, Ten 1/4′ hex bits, and 8-32 thread adapter also compatible with pull-thru style cleaning kits. The Twist is extremely lightweight at 1.8 oz. (3.7 oz. with included bits). And in such a small package your carry options are limited only by your imagination. For a low profile stow and go placement, slide it directly into an empty cell in your PALS webbing.